I'm a huge fan of greens. Kale and collards are my favorites but I like mustard greens, turnip greens, spinach, and Swiss chard as well. For awhile I was making kale and white bean soup constantly. Then I had a bumper crop of kale one summer and since I figured no one wanted hot soup on an eighty degree day I needed a new recipe. This salad was born. The beans are creamy, the kale is just barely wilted and still bright and green. The sweetness of the roasted peppers and garlic balance with the brightness of the lemon and richness of the olive oil. I just love this salad! 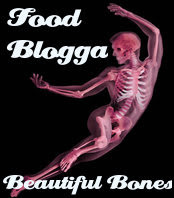 I'm adding this to a food blog event hosted by Food Blogga called Beautiful Bones. This recipe is perfect since kale and beans are rich in calcium and the vitamin C in the peppers and lemon juice can help you better absorb that calcium. Learn more about National Osteoporosis Awareness Month. Good as a meal with crusty bread or as a side dish with grilled vegetables or sausage. -First, roast the garlic. Preheat oven to 400 degrees F. Cut a head of garlic in half and drizzle with 1 teaspoon of olive oil, and a little sprinkle of salt and pepper. Wrap the garlic in a double layer of aluminum foil and roll down the edges to form a tight pouch. Place in the oven for ~1 1/2 hours. You can peek and remove it when you see that the garlic is golden brown and soft. Allow the garlic to cool until you can handle it. Squeeze the garlic cloves out of their skin into a large bowl. Smash the roasted cloves with a fork. Add the remaining tablespoon of olive oil, a pinch of salt and pepper and the lemon juice to the garlic. -Drain and rinse the beans. Add them to garlic mixture and toss. Set aside to marinade while you cook the other ingredients. -Now, roast the sweet peppers. (You can just buy the canned ones but they don't taste as good.) Wash and dry the peppers. Place the peppers on foil or cookie sheet under a hot broiler. Turn when the skin turns mostly black. Remove the peppers from the broiler when blackened on all sides. Cool until you can handle them and remove the peel and seeds. Slice into thin strips. Add to bowl with garlic sauce and beans. -Remove stems from kale and discard. Roughly chop or tear the leaves into ~2 inch pieces. Then dunk and swirl the kale leaves in a large bowl of clean water. If the kale is sandy or dirty repeat with clean water until clean. Remove the kale but don't dry it. Place the damp kale in a large pot or pan over medium heat with the red pepper flakes and a little salt and pepper. Turn the kale several times while it lightly steams in the water left from washing. Remove when all the kale has brighten in color and wilted down a little. -Add the kale to garlic mixture and toss together. Check the seasoning and add more lemon juice, salt, pepper or olive oil as needed. -Best served at room temperature.